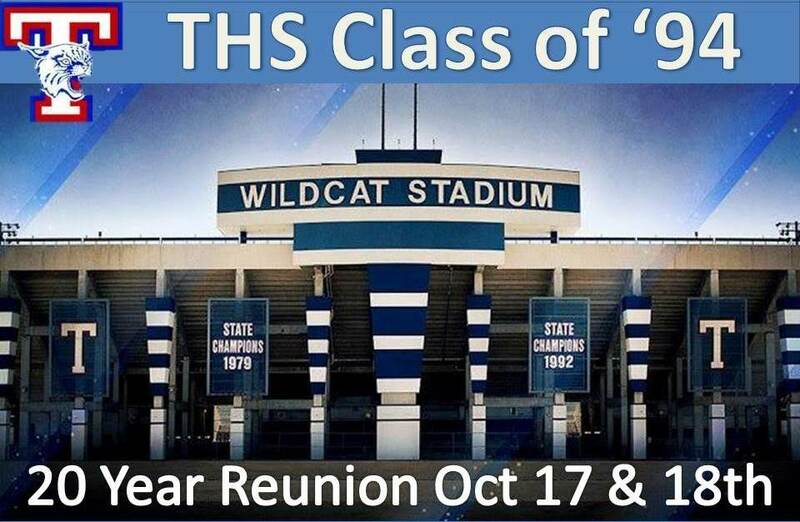 Lots of fun activities are planned for our 20 Year Reunion weekend including a tour of THS, Homecoming game, pre and post game events and get togethers, Wildcat Football golf, Alumni basketball game, family picnic in the park and on Saturday evening, an adults only party with food, fun, dancing and featuring our very own Cory Rushing as DJ who will be rocking the 80's, 90's and today's greatest hits. What: Friends, food, fun and dancing featuring our very own Cory Rushing DJ'ing the best hits of the 80's, 90's and today! Tickets must be purchased and presented at the door. ONLINE REGISTRATION ENDS on October 15th, prices increase at the door, so order your tickets today!